Just like weddings, birthday parties, job interviews and opportunities where you'll bump into exes/frenemies/horrible bosses, it's all too easy to be sent into a fashion spin which leads to a shopping bender. We've all been there, and I will probably continue to fall into that predictable fashion hole on occasion for the rest of time. However, for the period that usually sends me into the biggest cash-depleting frenzy (Fashion Week!) the gauntlet was thrown down my friends at Vestiaire Collective: they wanted me to take on their #vestiairecollectivefwchallenge. This meant wearing all pre-loved clothes and not buying anything new. At all. Not even a little something-something. I've never wanted to shop so much. 1. You can wear statement pieces over and over again. Feather-trimmed trousers sound elaborate (and I did buy these well over six months ago for New Year's Eve) but I've worn them time and again. 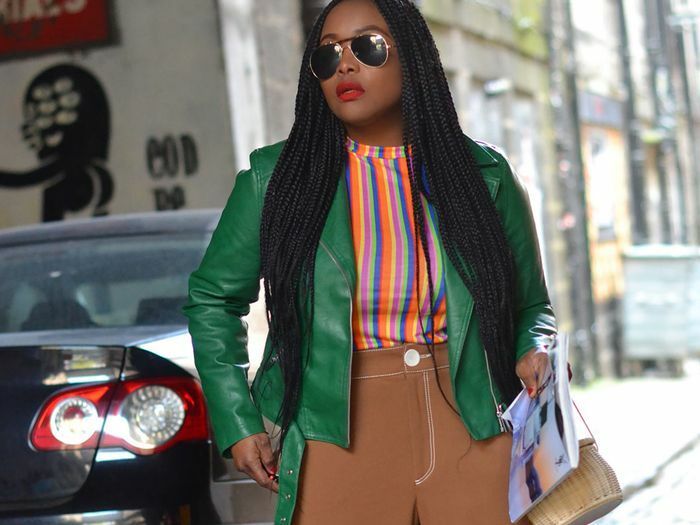 Look for statement pieces that have a talking point but aren't so loud and wacky and out of your comfort zone that they can't be worn in different ways. Everything I'm wearing here has already been in my closet for a while but this was the first time I put it all together: occasionally you just need to experiment at home and see what unexpected combinations you can put together. I take pics, send them to my mum and get her honest feedback! What I'm Wearing: A cashmere-blend cardigan from Ninety Nine Percent that's now in the sale for £150; although I bought these Kitri Kiki Trousers (£115) months ago they're still available; my Prada Galleria Mini Tote (£1200) has been used on repeat for a year now and will be in my wardrobe forever; I snapped up some random on-sale shoes from Yoox—it's a secret go-to for well-made affordable footwear from unknown brands; these Pascale James Lemon Slice Earrings (£455) have been my go-to all summer long; and this is an old Banana Republic belt I've probably had for about a decade. 2. 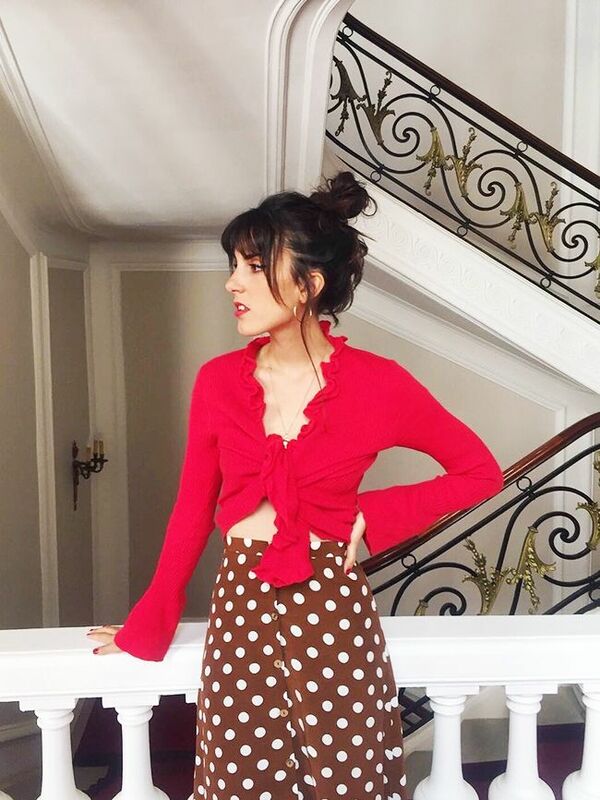 There are so many vintage trends in current fashion—search for them. 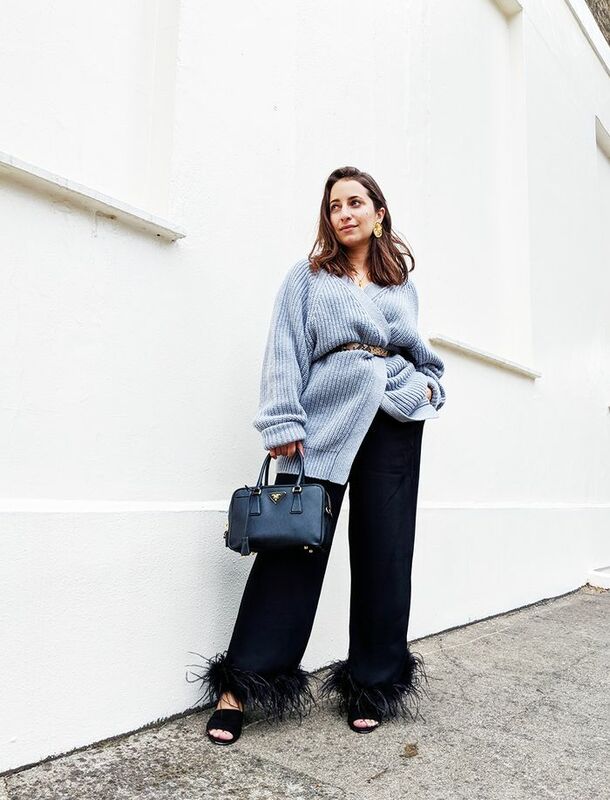 If there's one surefire way to locate great pre-loved pieces on Vestiaire Collective it's to know what vintage trends you should be looking for. Our A/W 18 report comes in very handy for that: 1980s chain-prints are back, as are logo handbags, so I swiftly managed to find this buttown-down and shoulder bag in no time. What I'm Wearing: A vintage chain-print shirt from Hermès feels like the most luxe and most authentic way to do this retro trend; the velvet Karen Millen pants came as part of a suit last year but they were a good shade of red to go with the shirt (I did realise that I had taken them up a bit too much though, must unpick and redo that hem for next time); my gold shoes are the same style as the black ones from Yoox [pictured above]—comfy, mid-height heels are always worth buying in different colourways; Fendi's vintage monogrammed shoulder bag notched up so many compliments during LFW. 3. Classic prints are always worth holding onto. There are certain prints and patterns that always come back into fashion: leopard, tartan and ditsy florals being three reliable ones. All of them are currently popular once more, so it's worth holding onto them if you own anything, as well as picking up second hand versions for now or the future. You don't have to grab the latest iteration to tap into the look, and it's far cooler to have a unique option no one else owns. What I'm Wearing: As I knew leopard print was having a moment I figured the best thing to do was to search for the kind of designers who specialise in that type of print, like Roberto Cavalli. This camisole and shirt is part of a set I found on Vestiaire; I made it feel less '90s by belting it with a vintage Fendi logo belt, wearing it loose over my surprisingly trusty Kitri trousers again; black sandals are the same as I wore on the first day; I admit to a slight cheat here, this cute bag is from a new label called Cafuné and they very kindly gave me one to carry for fashion month. The same gold Fendi baguette would have worked just as well. 4. Look for the past-season pieces you missed out on. Everyone loves a list, right? So on my phone I have a note for designer and high street pieces I've missed out on over the seasons. Buying them second hand or pre-loved not only means you snap up the item you've been pining for, but it's a far more environmentally friendly way to shop. I personally do not subscribe to the school of thinking you can only look "on-trend" in new items—there's so much that's still relevant and desirable from every season in the past. What I'm Wearing: You probably recognise the bag and sandals by now; this beautiful red dress is Rejina Pyo from spring/summer 2018 that I missed the first time around but managed to locate on Vestiaire Collective; my sunglasses are also Rejina Pyo, from a collaboration with Korean eyewear brand Projekt Produkt—I have worn them every sunny day this year. 5. Accessories are always easier to buy second-hand than clothes. If the thought of buying pre-loved clothes freaks you out (sizing and choice can both feel overwhelming) but you still want a less-guilty outfit update then I would focus your attention on accessories. Many designer handbags can actually make you money and be a worthwhile investment. Many of your existing shoes can be looked after and worn on repeat for years and years (make friends with a cobbler and get them re-soled before wearing). Jewellery comes in and out of fashion, so be sure to hold onto your favourite pieces even if they don't feel au courant right now. What I'm Wearing: Okay, so I technically bought this Ghost Danielle Dress (£120) before the challenge began because I thought it would be great for weddings, so can I get brownie points for the fact that none of my accessories are new? The Fendi bag and Pascale James earrings make yet another appearance; these red Uterque sandals have been going for two summers now; my chain belt is a vintage piece I picked up a decade ago in east London. So right for this season's python-print trend. I never tire of gaudy '90s and '80s designer jewellery. Manolo's classic styles are trending once more, so jump on the look with vintage creations from the shoe guru. Not everyone has cottoned onto the potential of vintage Hermès shirts yet, so get them before they become too pricey. Like I said already, checks are always coming back into fashion so this is a clever purchase. Vestiaire is a great place to find classic jewellery pieces. What did I tell you about finding classic animal print-loving designers? Quality shades for a far friendlier amount. The kind of flattering piece you'll pull out each and every winter. Phoebe Philo superfans are buying up old stock now the designer has left Céline. Next up, the coolest looks from LFW's streets.